The Fayetteville Firefighters would like to thank everyone who donated to our annual Fill The Boot Drive for MDA. We reached and went over our goal for this year thanks to you. We will be announcing the final total at the end of May once we have made the donation to MDA. All the money raised stays right here in Arkansas and helps our friends and neighbors who suffer from this terrible disease. 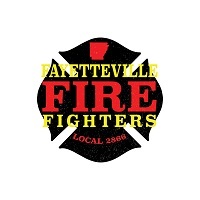 In conjunction with the Fire Service Joint Labor Management Wellness-Fitness Initiative (WFI), IAFF members are invited to attend a Peer Fitness Trainer (PFT) course hosted by Fayetteville, AR Local 2866 and the Fayetteville Fire Department May 20-24, 2019. Through a combination of lectures and hands-on activities, participants attending this five-day course will improve their ability to assess, design, implement and evaluate exercise sessions for fire fighters with varying interests, as well as have the knowledge and skills to become fitness and wellness leaders within their department. Upon completion of this course and successfully passing the exam, attendees will also have access to three peer-to-peer workshops that can be delivered to other members of their department. Fire fighters, EMS providers and anyone involved in their fire department's wellness-fitness program are eligible to participate. To register and submit payment, contact: Braden Flood at bflood@fayetteville-ar.gov or call (479) 575-8365 (office) or (479) 409-5721 (mobile). The IAFF/IAFC PFT program provides a fitness trainer standard consistent with the health and fitness needs of the fire service in the United States and Canada.